Check the Fien Print: MovieWatch: "Spider-Man 3"
In a Nutshell: Most folks seem to be on cell phone plans with roll-over minutes these days, but I miss the days back before roll-over, those days when you'd get random calls out of the blue from high school or college friends who'd pretty much come out and say "Yeah, I had a few extra minutes this month, so I thought I'd call you." I mean, if they didn't use the minutes, that time was just wasted and they'd never get it back, so they scraped the bottom of their address book barrel just to make sure that Ma Bell didn't win. That there is a convoluted way of leading to this observation: Sam Raimi directs "Spider-Man 3" like the franchise's cell phone plan doesn't include roll-over minutes. Raimi, who always insisted that he was done after three movies, seems to sense the franchise's expiration date as he throws new characters and villains up on the screen with an abandon that's initially exhilarating, but eventually becomes reckless. There's an audience out there that will probably be quite satisfied by the very real thrills that Raimi lays out -- they're saying that this is the most expensive movie ever made (until they say the same darned thing about "Pirates of the Caribbean 3") and it's pretty much up on the screen (and probably in what I imagine to be copious deleted scenes for the DVD). The special effects are tremendous and two or three of the set pieces easily outstrip anything from those first two blockbuster films. There's a bigger audience, I suspect, that will be able to see through how flimsy Raimi's narrative house-of-cards really is. The movie has three main villains, two main love triangles and yet Raimi still tries to find the time for Kirsten Dunst to get two different musical numbers. While juggling all of those big action beats and the inevitable heroic duality emotionalism, Raimi makes an effort to tie up every emotional loose thread from the first movie (it's a bit like the second movie didn't happen). It all feels like he knew (hoped?) he wouldn't have to do this again a fourth time. If he'd known that he had one more "Spider-Man" in him, perhaps there'd have been time to do justice to everything. There will be inevitable damning comparisons to the similarly over-extended "Batman Forever." Let's not go overboard. Raimi is too good a filmmaker for that to happen, but he also should have been too good to think this uneven film was a good capper to his franchise. What Works: Although the digital construction of Sandman makes the character look a *bit* too much like he's made of Dippin' Dots, the character's birth -- forming from a huge pile of sand -- is a gorgeous moment, complimented by Christopher Young's fine score. I also liked the character that Raimi finds in Thomas Hayden Church's face so much that I wished the movie was actually about Flint Marko/Sandman, rather than making him into only the villain of the movie's middle act. 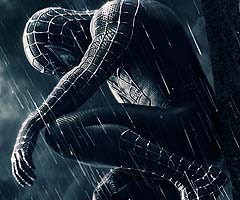 I approved of Topher Grace's work as Eddie Brock, seemingly Peter Parker's less fortunate double. I wished that Eddie had been introduced as a character in the movie, had his resentment of Peter set up, but then left the arrival of Venom for a fourth movie in which that character could have been the main villain, rather than an obstacle for the third act. To be fair, I liked the movie's first act as much as anything in the franchise. New Goblin and Sandman should have been sufficient adversaries to carry an entire film on their own. Interestingly, despite all of the bad guys, the most harrowing scene in the piece doesn't feature any of the big villains. It's just Spidey trying to save occupants of a skyscraper from an out-of-control construction crane. What Fails: I've been to enough comic conventions to know two things: Venom is a character loved and despised in equal measure, while everybody who remembers her loved Gwen Stacy. Comic purists aren't likely to be happy with the way either character is treated here, with Gwen getting truly stiffed. If you didn't know how important Gwen was to the Spidey mythology, you'd think she was just a random character who pops in and out of this sequel and never makes an impression. It's not Bryce Dallas Howard's fault and it's great to see that freed from the responsibility of being M. Night Shyamalan's anemic, ultra-serious alter ego, she's absolutely radiant. But she's wasted. Also wasted? James Cromwell, Bill Nunn, Dylan Baker, Theresa Russell and Elizabeth Banks. By pure force of personality J.K. Simmons is memorable. Good for him. Oh and Rosemary Harris' Aunt May is so badly tied into the rest of the movie that I wanted to nap whenever she arrived. On a side note, the best part of my "Spider-Man 3" experience was actually the Diddy Riese ice cream sandwich I grabbed across the street from the Westwood theater that housed the screening. There was a 35 minute line to recover cell phones after the movie, so I went across the street and grabbed a scoop of peanut butter ice cream between two white chocolate chip cookies. Yum. The price is up to $1.25. It's about the best deal in the world.